CHAPTER 3 The Internal Environment: Resources, Capabilities, and Core Competencies © 2007 Thomson/South-Western. All rights reserved. 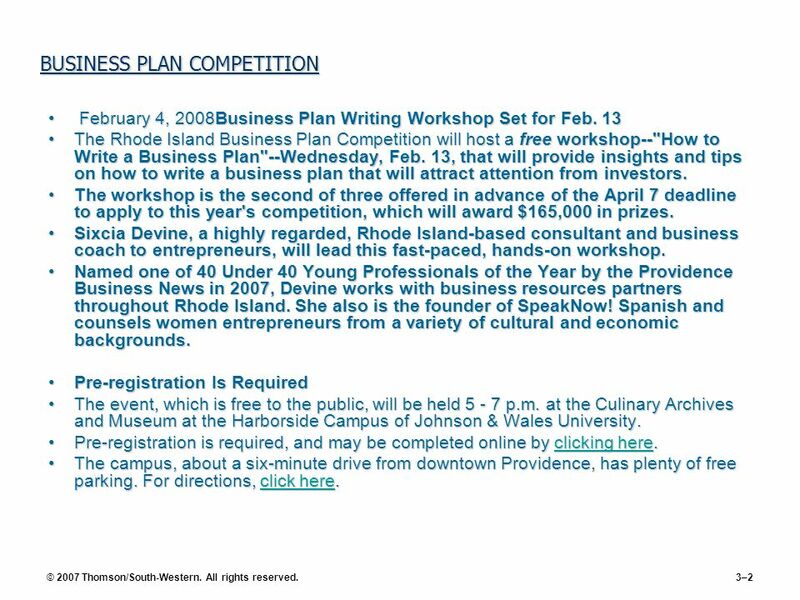 February 4, 2008Business Plan Writing Workshop Set for Feb. 13 The Rhode Island Business Plan Competition will host a free workshop--"How to Write a Business Plan"--Wednesday, Feb. 13, that will provide insights and tips on how to write a business plan that will attract attention from investors. The workshop is the second of three offered in advance of the April 7 deadline to apply to this year's competition, which will award $165,000 in prizes. Sixcia Devine, a highly regarded, Rhode Island-based consultant and business coach to entrepreneurs, will lead this fast-paced, hands-on workshop. Named one of 40 Under 40 Young Professionals of the Year by the Providence Business News in 2007, Devine works with business resources partners throughout Rhode Island. She also is the founder of SpeakNow! Spanish and counsels women entrepreneurs from a variety of cultural and economic backgrounds. Pre-registration Is Required The event, which is free to the public, will be held p.m. at the Culinary Archives and Museum at the Harborside Campus of Johnson & Wales University. Pre-registration is required, and may be completed online by clicking here. The campus, about a six-minute drive from downtown Providence, has plenty of free parking. For directions, click here. © 2007 Thomson/South-Western. All rights reserved. Final Workshop: March The final free workshop of the 2008 Rhode Island Business Plan Competition--"How to Present Your Business Plan"--will be held March 13. The event will feature successful Rhode Island entrepreneurs who will provide do's and don'ts on how to present a plan to investors. To register, click here. 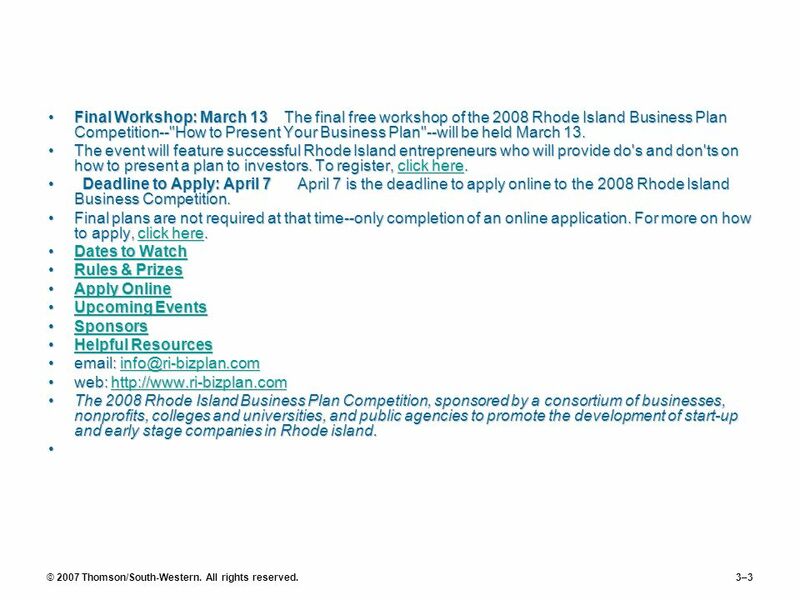 Deadline to Apply: April April 7 is the deadline to apply online to the 2008 Rhode Island Business Competition. Final plans are not required at that time--only completion of an online application. For more on how to apply, click here. Dates to Watch Rules & Prizes Apply Online Upcoming Events Sponsors Helpful Resources web: The 2008 Rhode Island Business Plan Competition, sponsored by a consortium of businesses, nonprofits, colleges and universities, and public agencies to promote the development of start-up and early stage companies in Rhode island. © 2007 Thomson/South-Western. All rights reserved. 4 Define value and discuss its importance. 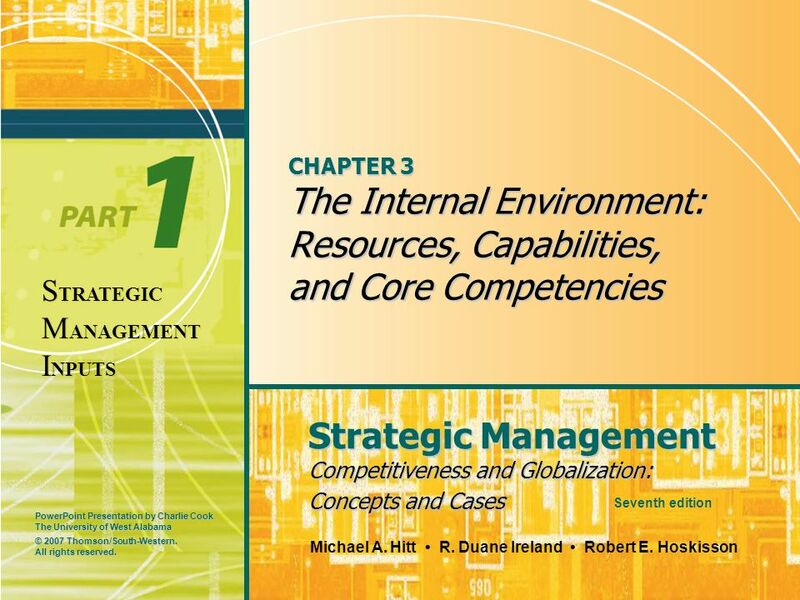 KNOWLEDGE OBJECTIVES Studying this chapter should provide you with the strategic management knowledge needed to: Explain the need for firms to study and understand their internal environment. Define value and discuss its importance. 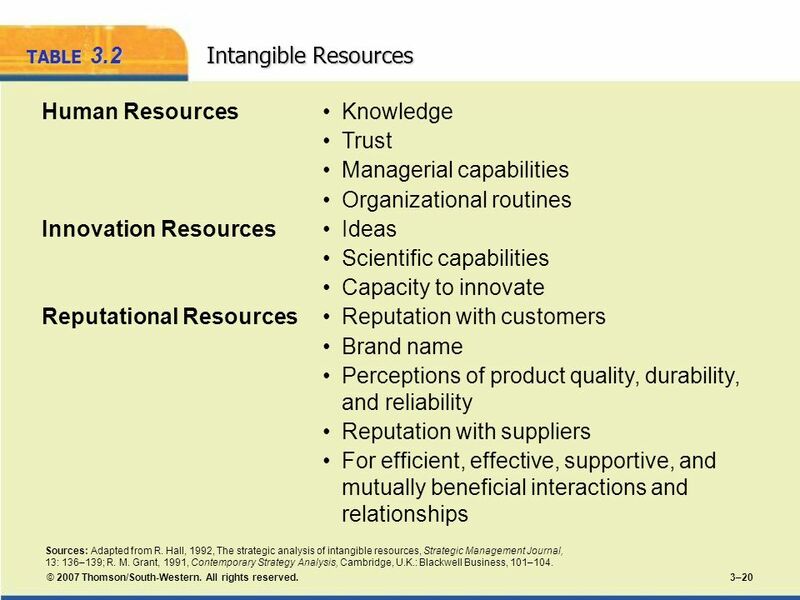 Describe the differences between tangible and intangible resources. Define capabilities and discuss how they are developed. Describe four criteria used to determine whether resources and capabilities are core competencies. © 2007 Thomson/South-Western. All rights reserved. 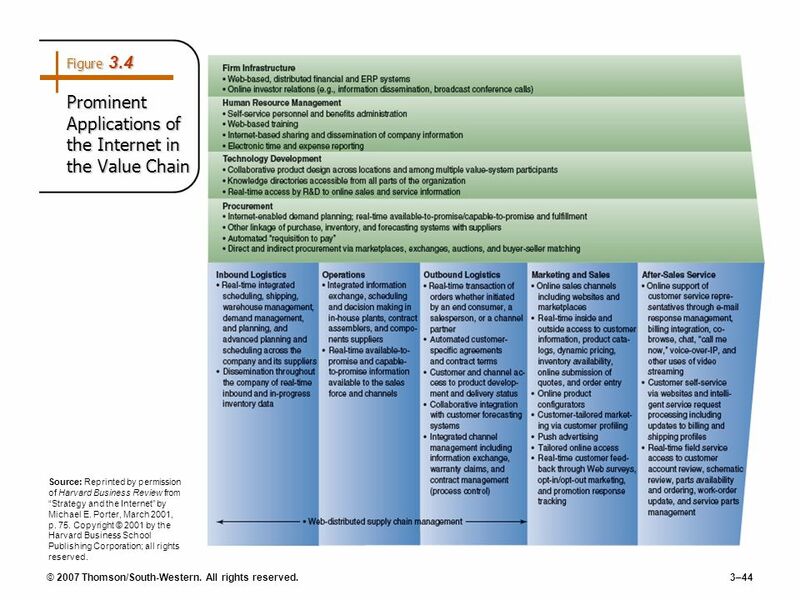 Studying this chapter should provide you with the strategic management knowledge needed to: Explain how value chain analysis is used to identify and evaluate resources and capabilities. 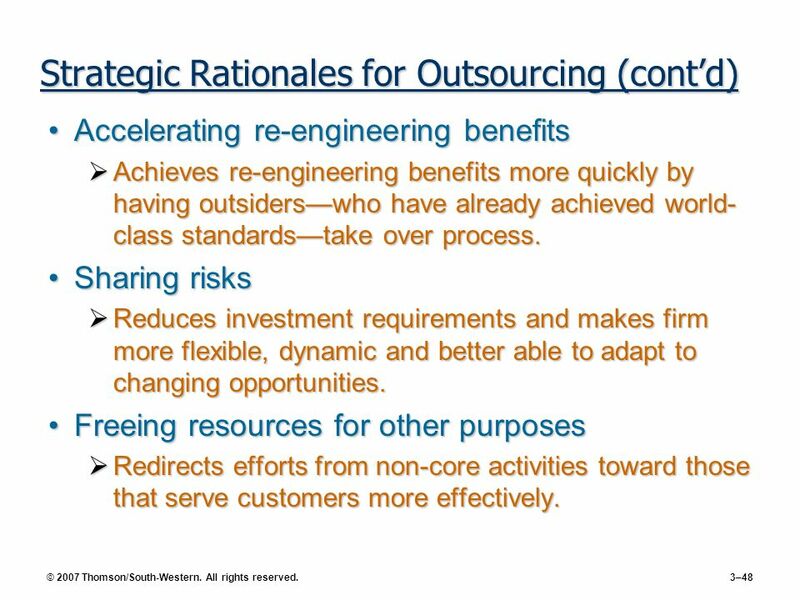 Define outsourcing and discuss the reasons for its use. Discuss the importance of identifying internal strengths and weaknesses. © 2007 Thomson/South-Western. All rights reserved. 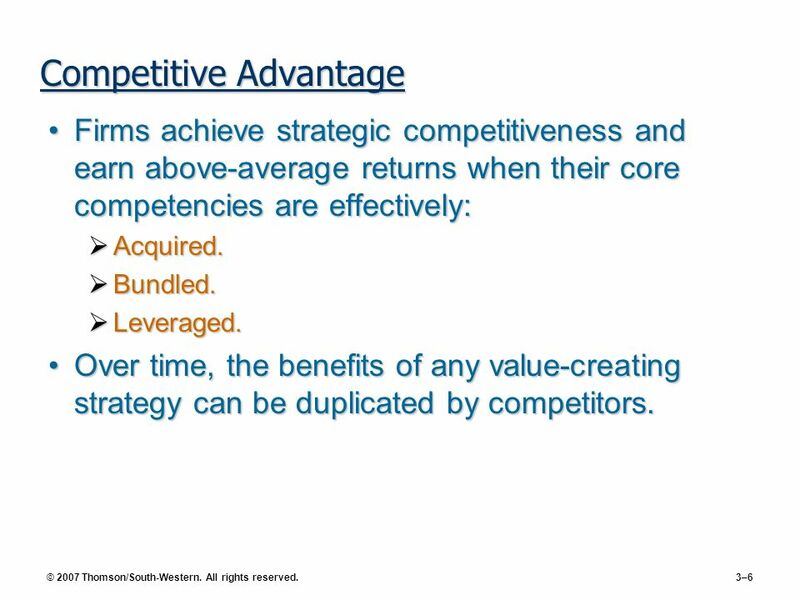 Firms achieve strategic competitiveness and earn above-average returns when their core competencies are effectively: Acquired. Bundled. Leveraged. Over time, the benefits of any value-creating strategy can be duplicated by competitors. © 2007 Thomson/South-Western. All rights reserved. 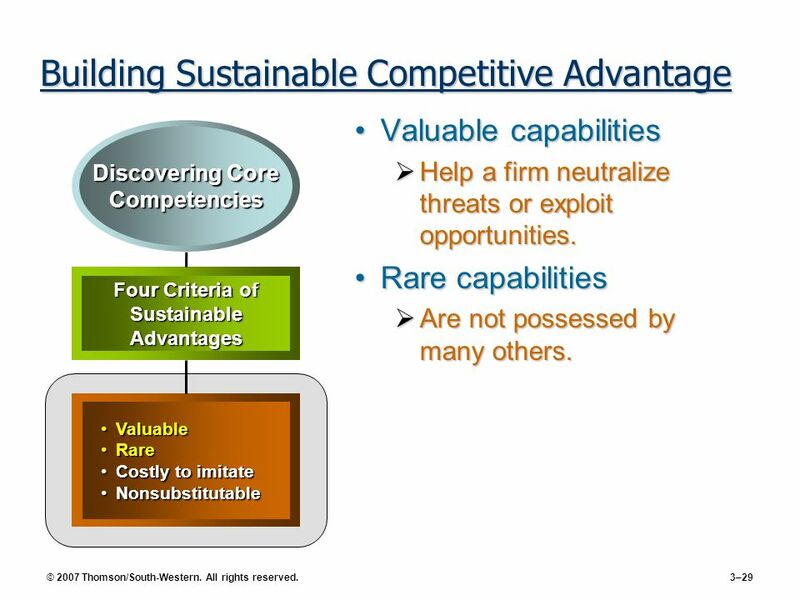 Sustainability of a competitive advantage is a function of: The rate of core competence obsolescence due to environmental changes. The availability of substitutes for the core competence. The difficulty competitors have in duplicating or imitating the core competence. © 2007 Thomson/South-Western. All rights reserved. 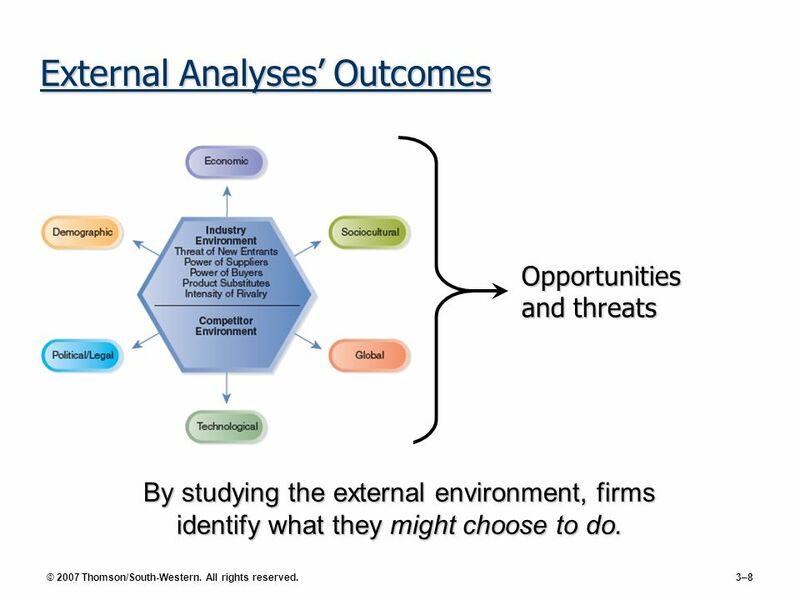 Opportunities and threats By studying the external environment, firms identify what they might choose to do. © 2007 Thomson/South-Western. All rights reserved. 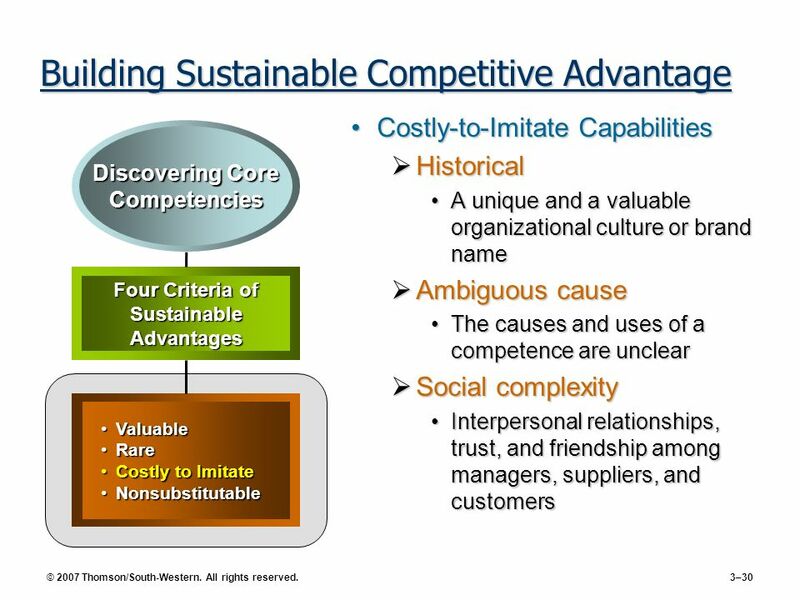 Unique resources, capabilities, and competencies (required for sustainable competitive advantage) By studying the internal environment, firms identify what they can do © 2007 Thomson/South-Western. All rights reserved. Global Economy Traditional sources of advantages can be overcome by competitors’ international strategies and by the flow of resources throughout the global economy. Global Mind-Set The ability to study an internal environment in ways that are not dependent on the assumptions of a single country, culture, or context. 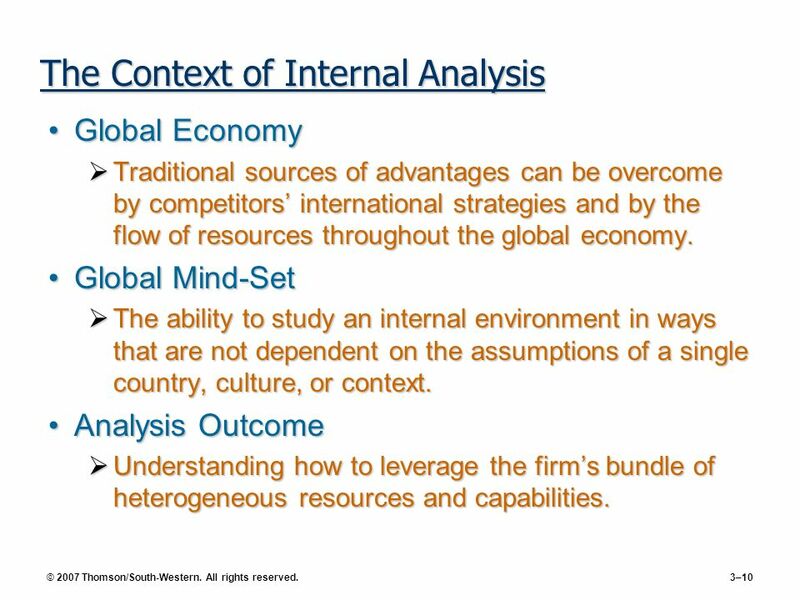 Analysis Outcome Understanding how to leverage the firm’s bundle of heterogeneous resources and capabilities. © 2007 Thomson/South-Western. All rights reserved. 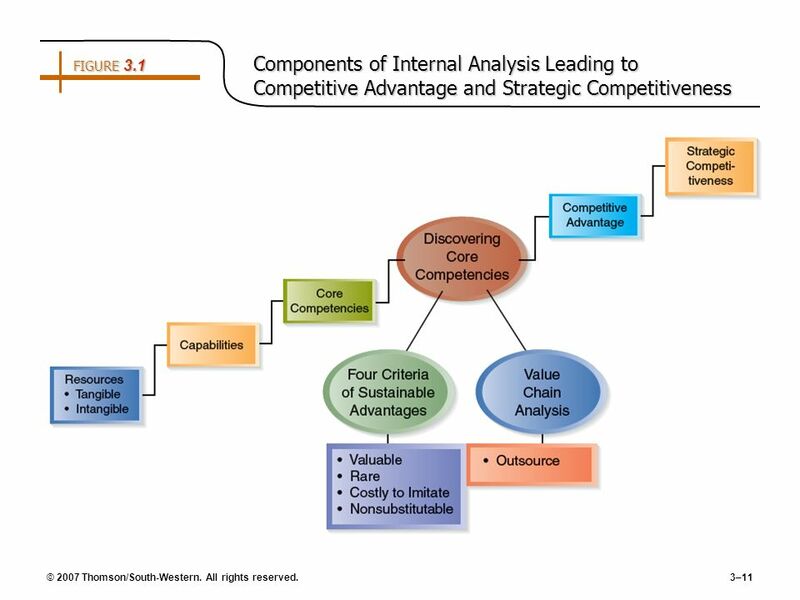 11 FIGURE 3.1	Components of Internal Analysis Leading to Competitive Advantage and Strategic Competitiveness © 2007 Thomson/South-Western. All rights reserved. 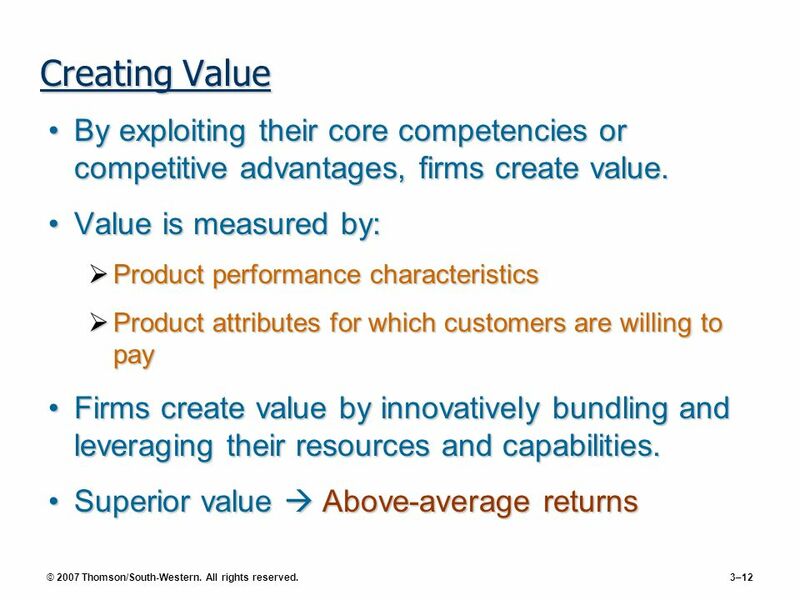 12 Creating Value By exploiting their core competencies or competitive advantages, firms create value. 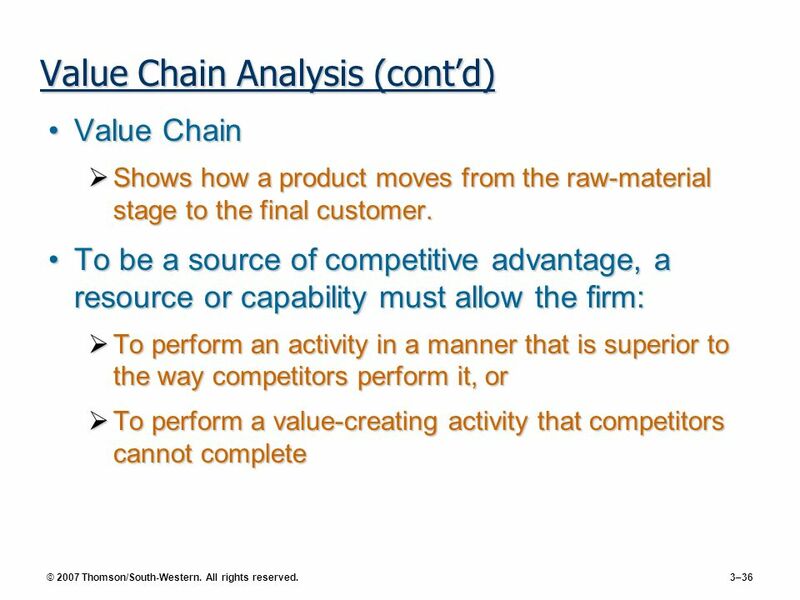 Value is measured by: Product performance characteristics Product attributes for which customers are willing to pay Firms create value by innovatively bundling and leveraging their resources and capabilities. Superior value  Above-average returns © 2007 Thomson/South-Western. All rights reserved. 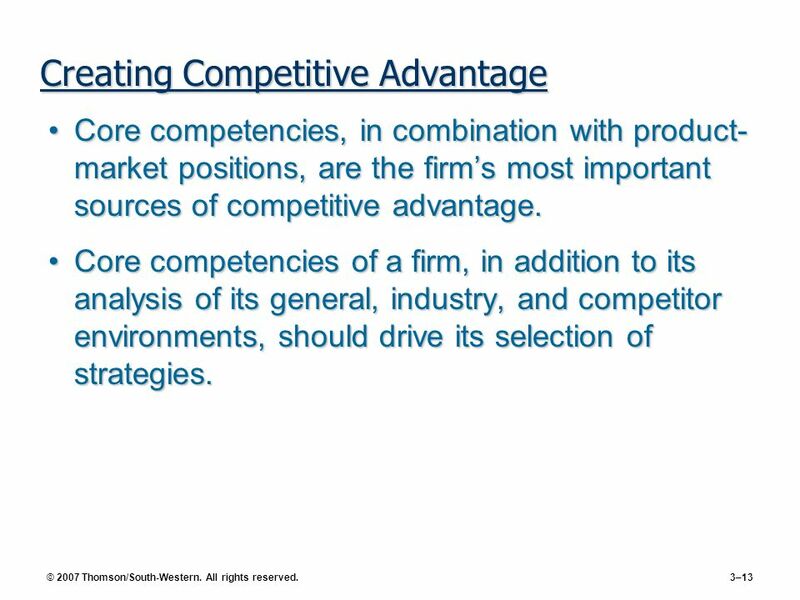 Core competencies, in combination with product-market positions, are the firm’s most important sources of competitive advantage. 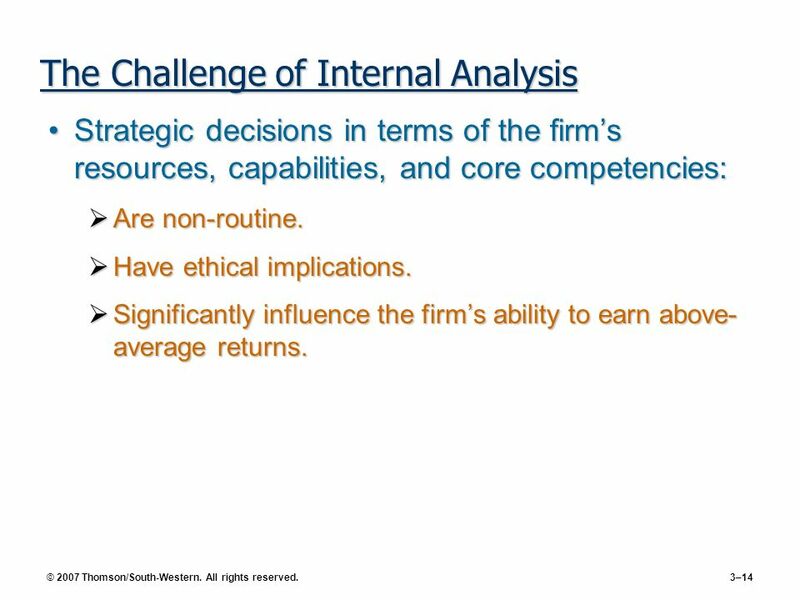 Core competencies of a firm, in addition to its analysis of its general, industry, and competitor environments, should drive its selection of strategies. © 2007 Thomson/South-Western. All rights reserved. Strategic decisions in terms of the firm’s resources, capabilities, and core competencies: Are non-routine. Have ethical implications. Significantly influence the firm’s ability to earn above-average returns. © 2007 Thomson/South-Western. All rights reserved. 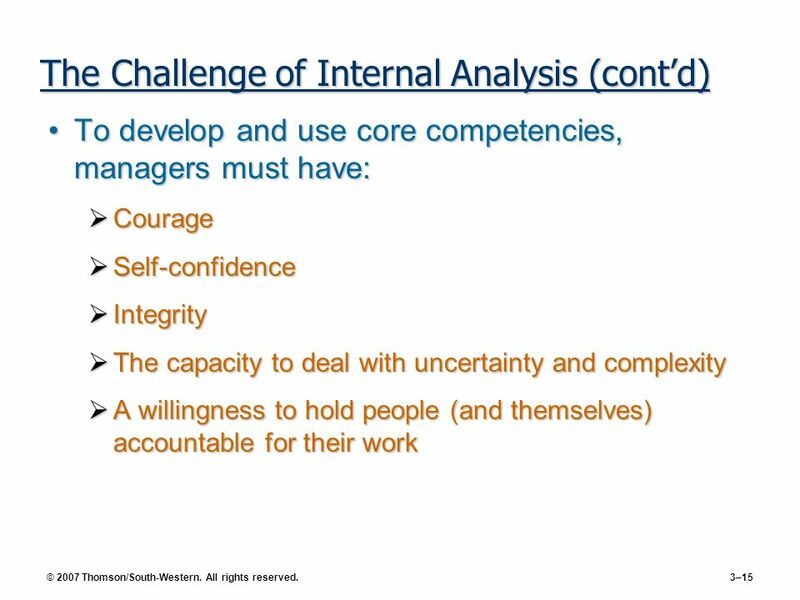 To develop and use core competencies, managers must have: Courage Self-confidence Integrity The capacity to deal with uncertainty and complexity A willingness to hold people (and themselves) accountable for their work © 2007 Thomson/South-Western. All rights reserved. 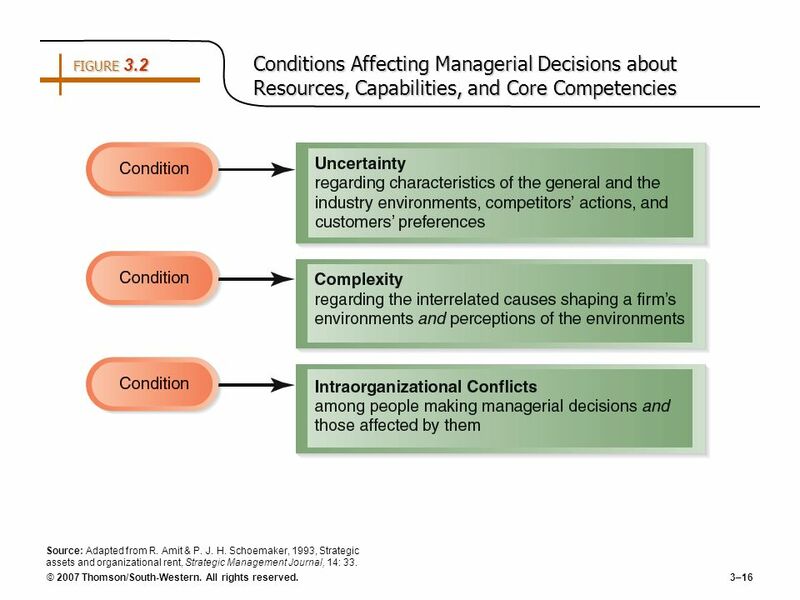 16 FIGURE 3.2	Conditions Affecting Managerial Decisions about Resources, Capabilities, and Core Competencies Source: Adapted from R. Amit & P. J. H. Schoemaker, 1993, Strategic assets and organizational rent, Strategic Management Journal, 14: 33. © 2007 Thomson/South-Western. All rights reserved. Are the source of a firm’s capabilities. Are broad in scope. Cover a spectrum of individual, social and organizational phenomena. Alone, do not yield a competitive advantage. 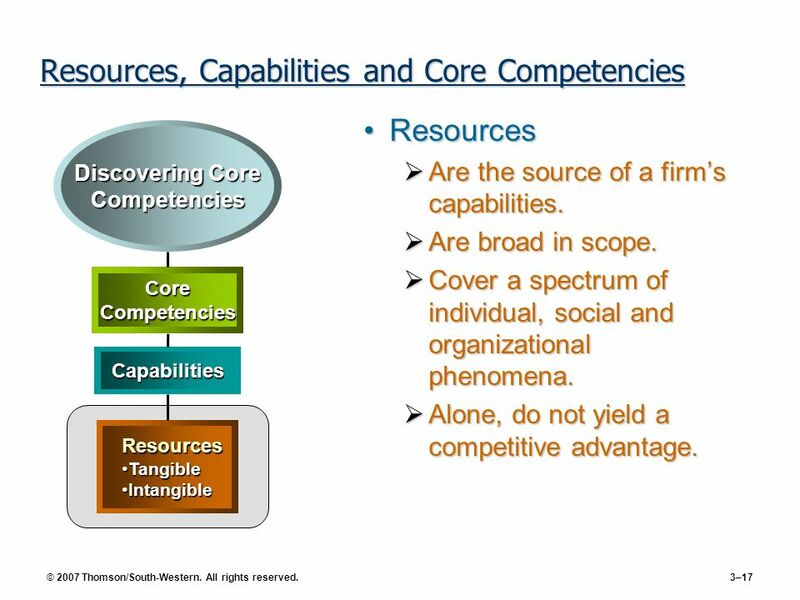 Discovering Core Competencies Core Competencies Capabilities Resources Tangible Intangible © 2007 Thomson/South-Western. All rights reserved. Are a firm’s assets, including people and the value of its brand name. 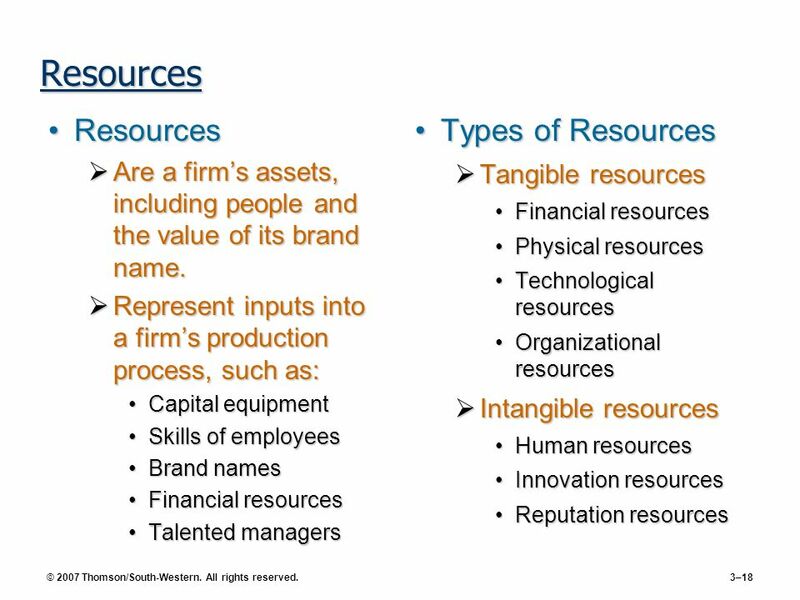 Represent inputs into a firm’s production process, such as: Capital equipment Skills of employees Brand names Financial resources Talented managers Types of Resources Tangible resources Financial resources Physical resources Technological resources Organizational resources Intangible resources Human resources Innovation resources Reputation resources © 2007 Thomson/South-Western. All rights reserved. 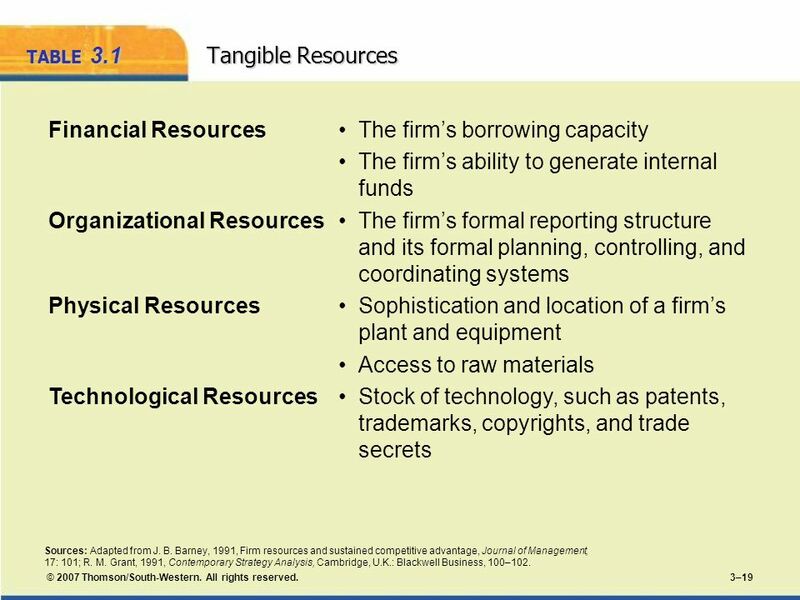 Financial Resources •	The firm’s borrowing capacity •	The firm’s ability to generate internal funds Organizational Resources	•	The firm’s formal reporting structure and its formal planning, controlling, and coordinating systems Physical Resources	•	Sophistication and location of a firm’s plant and equipment •	Access to raw materials Technological Resources	•	Stock of technology, such as patents, trademarks, copyrights, and trade secrets Sources: Adapted from J. B. Barney, 1991, Firm resources and sustained competitive advantage, Journal of Management, 17: 101; R. M. Grant, 1991, Contemporary Strategy Analysis, Cambridge, U.K.: Blackwell Business, 100–102. © 2007 Thomson/South-Western. All rights reserved. Human Resources	•	Knowledge •	Trust •	Managerial capabilities •	Organizational routines Innovation Resources	•	Ideas •	Scientific capabilities •	Capacity to innovate Reputational Resources	•	Reputation with customers •	Brand name •	Perceptions of product quality, durability, and reliability •	Reputation with suppliers •	For efficient, effective, supportive, and mutually beneficial interactions and relationships Sources: Adapted from R. Hall, 1992, The strategic analysis of intangible resources, Strategic Management Journal, 13: 136–139; R. M. Grant, 1991, Contemporary Strategy Analysis, Cambridge, U.K.: Blackwell Business, 101–104. © 2007 Thomson/South-Western. All rights reserved. Represent the capacity to deploy resources that have been purposely integrated to achieve a desired end state Emerge over time through complex interactions among tangible and intangible resources Often are based on developing, carrying and exchanging information and knowledge through the firm’s human capital Discovering Core Competencies Core Competencies Capabilities Resources Tangible Intangible © 2007 Thomson/South-Western. All rights reserved. 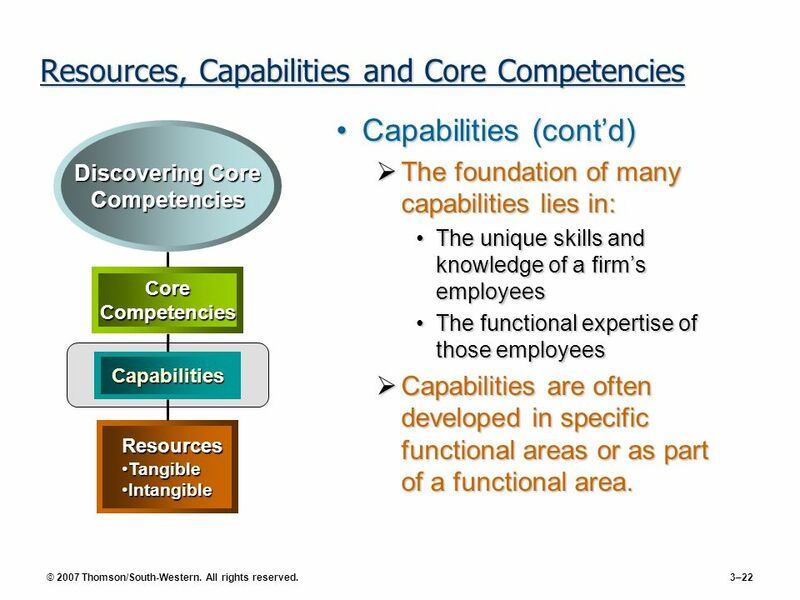 Capabilities (cont’d) The foundation of many capabilities lies in: The unique skills and knowledge of a firm’s employees The functional expertise of those employees Capabilities are often developed in specific functional areas or as part of a functional area. 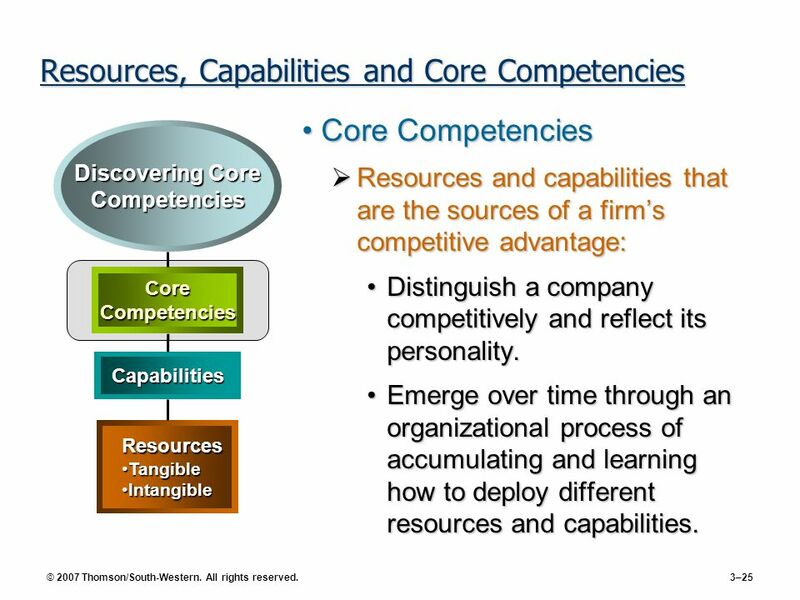 Discovering Core Competencies Core Competencies Capabilities Resources Tangible Intangible © 2007 Thomson/South-Western. All rights reserved. Functional Areas Capabilities Distribution Effective use of logistics management techniques Human resources Motivating, empowering, and retaining employees Management	Effective and efficient control of inventories through information systems	point-of-purchase data collection methods Marketing	Effective promotion of brand-name products Effective customer service Innovative merchandising Management	Ability to envision the future of clothing Effective organizational structure Manufacturing	Design and production skills yielding reliable products Product and design quality Miniaturization of components and products Research & Innovative technology development Development of sophisticated elevator control solutions Rapid transformation of technology into new products and processes Digital technology © 2007 Thomson/South-Western. All rights reserved. 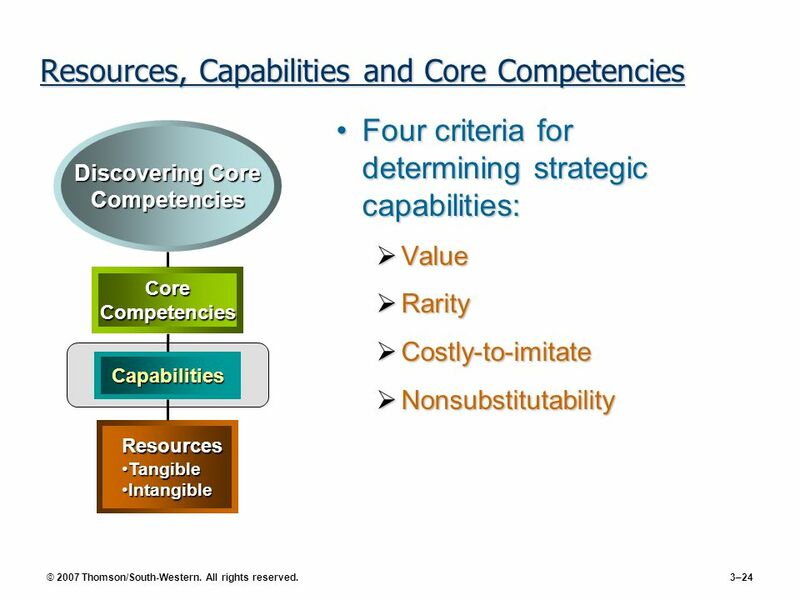 Four criteria for determining strategic capabilities: Value Rarity Costly-to-imitate Nonsubstitutability Discovering Core Competencies Core Competencies Capabilities Resources Tangible Intangible © 2007 Thomson/South-Western. All rights reserved. Resources and capabilities that are the sources of a firm’s competitive advantage: Distinguish a company competitively and reflect its personality. Emerge over time through an organizational process of accumulating and learning how to deploy different resources and capabilities. 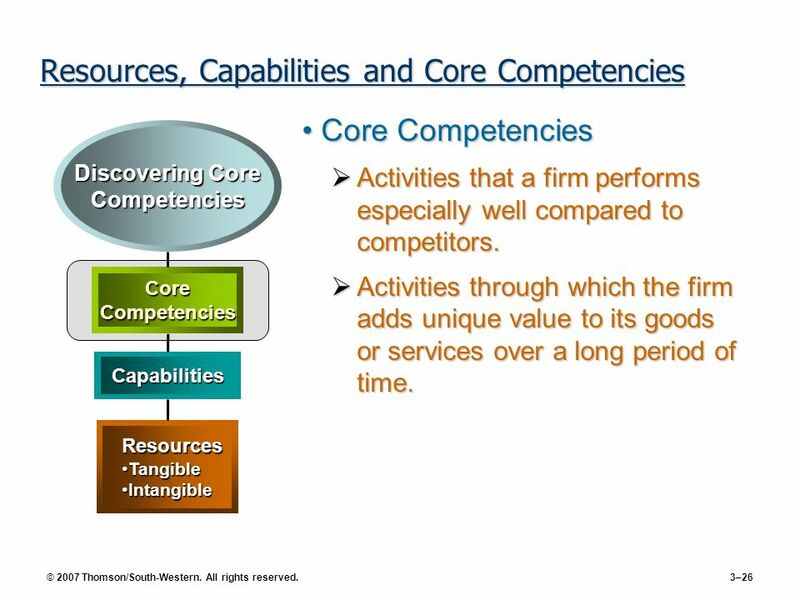 Discovering Core Competencies Core Competencies Capabilities Resources Tangible Intangible © 2007 Thomson/South-Western. All rights reserved. Activities that a firm performs especially well compared to competitors. Activities through which the firm adds unique value to its goods or services over a long period of time. Discovering Core Competencies Core Competencies Capabilities Resources Tangible Intangible © 2007 Thomson/South-Western. All rights reserved. 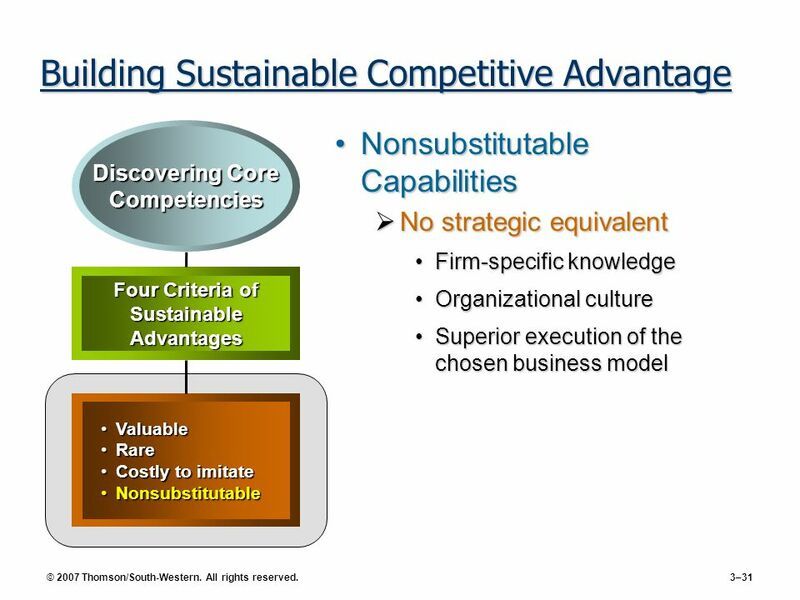 Four Criteria of Sustainable Competitive Advantage Valuable capabilities Rare capabilities Costly to imitate Nonsubstituable Discovering Core Competencies Four Criteria of Sustainable Advantages Valuable Rare Costly to imitate Nonsubstitutable © 2007 Thomson/South-Western. All rights reserved. Valuable Capabilities	•	Help a firm neutralize threats or exploit opportunities Rare Capabilities	•	Are not possessed by many others Costly-to-Imitate Capabilities	•	Historical: A unique and a valuable organizational culture or brand name •	Ambiguous cause: The causes and uses of a competence are unclear •	Social complexity: Interpersonal relationships, trust, and friendship among managers, suppliers, and customers Nonsubstitutable Capabilities	•	No strategic equivalent © 2007 Thomson/South-Western. All rights reserved. Valuable capabilities Help a firm neutralize threats or exploit opportunities. Rare capabilities Are not possessed by many others. 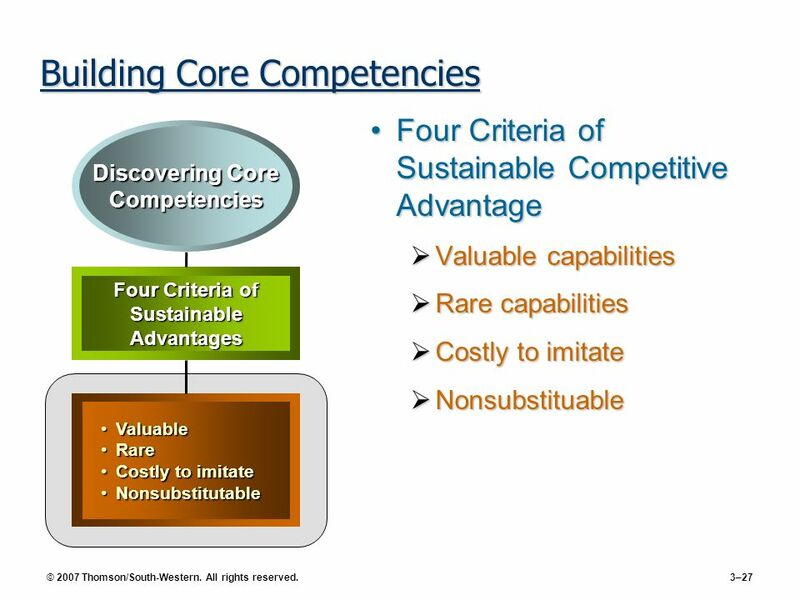 Discovering Core Competencies Four Criteria of Sustainable Advantages Valuable Rare Costly to imitate Nonsubstitutable © 2007 Thomson/South-Western. All rights reserved. Costly-to-Imitate Capabilities Historical A unique and a valuable organizational culture or brand name Ambiguous cause The causes and uses of a competence are unclear Social complexity Interpersonal relationships, trust, and friendship among managers, suppliers, and customers Discovering Core Competencies Four Criteria of Sustainable Advantages Valuable Rare Costly to Imitate Nonsubstitutable © 2007 Thomson/South-Western. All rights reserved. 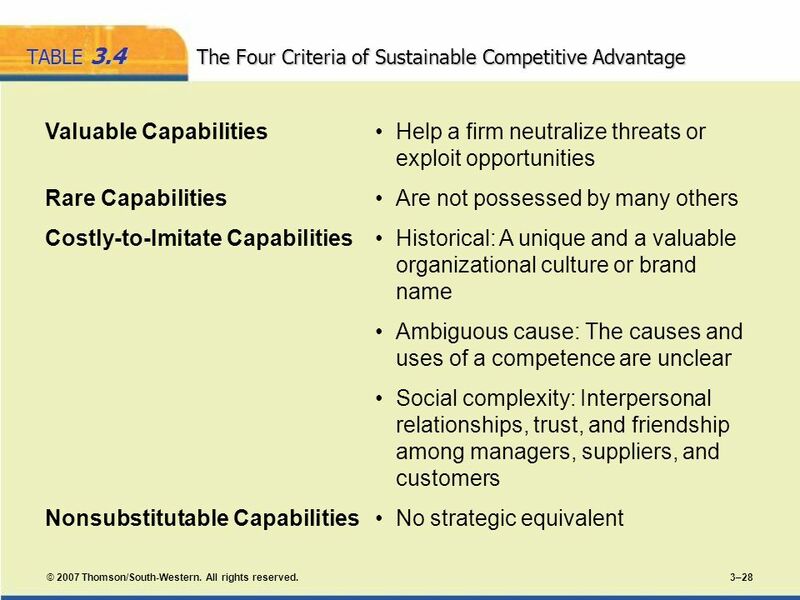 Discovering Core Competencies Nonsubstitutable Capabilities No strategic equivalent Firm-specific knowledge Organizational culture Superior execution of the chosen business model Four Criteria of Sustainable Advantages Valuable Rare Costly to imitate Nonsubstitutable © 2007 Thomson/South-Western. All rights reserved. Costly to Imitate? Nonsubstitutable? Valuable? 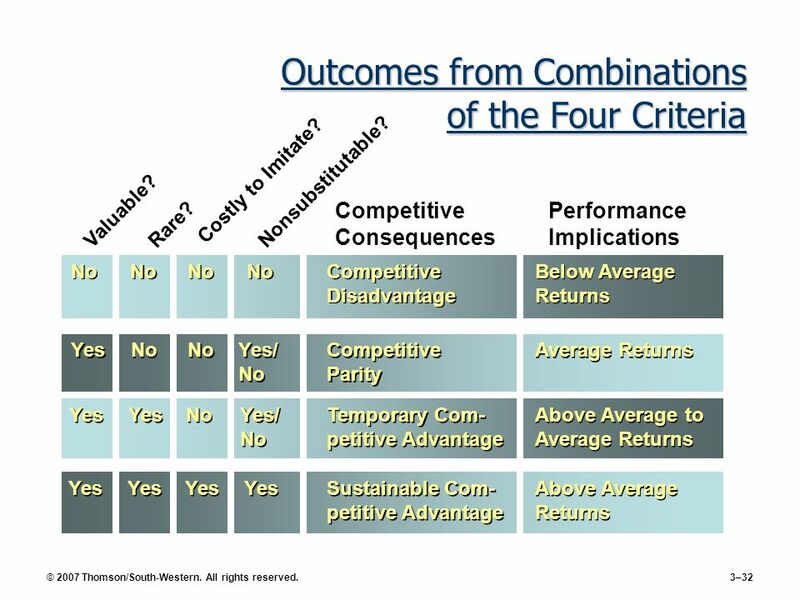 Competitive Consequences Performance Implications Rare? 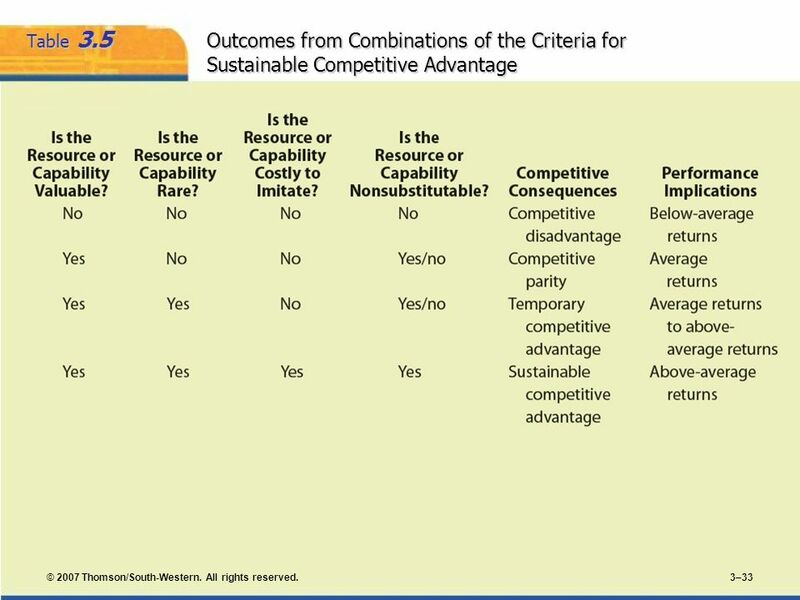 No No No No Competitive Disadvantage Below Average Returns Yes No No Yes/ No Competitive Parity Average Returns Yes Yes No Yes/ No Temporary Com- petitive Advantage Above Average to Average Returns Yes Yes Yes Yes Sustainable Com- petitive Advantage Above Average Returns © 2007 Thomson/South-Western. All rights reserved. 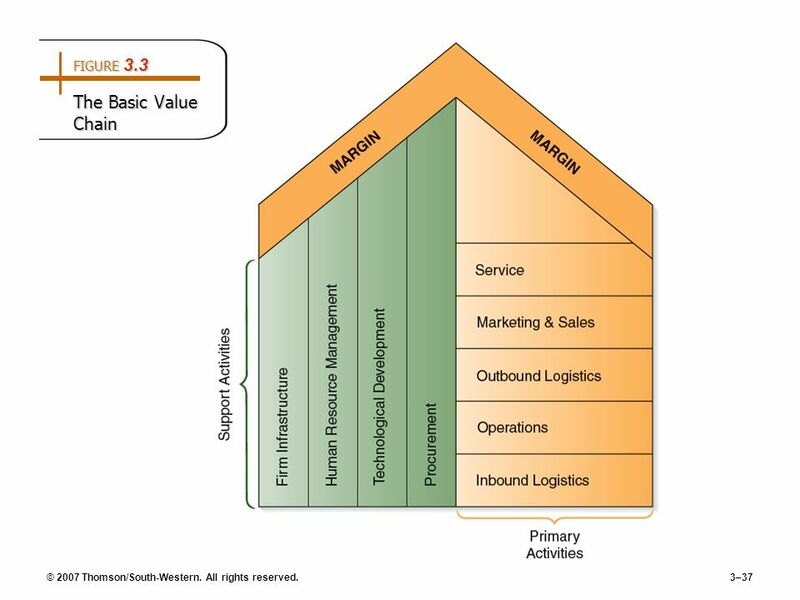 34 Value Chain Analysis Allows the firm to understand the parts of its operations that create value and those that do not. 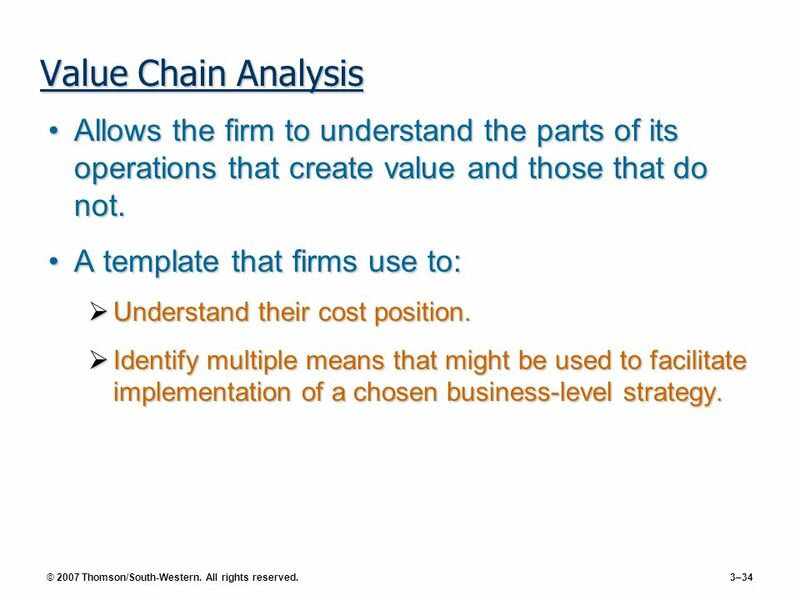 A template that firms use to: Understand their cost position. Identify multiple means that might be used to facilitate implementation of a chosen business-level strategy. © 2007 Thomson/South-Western. All rights reserved. 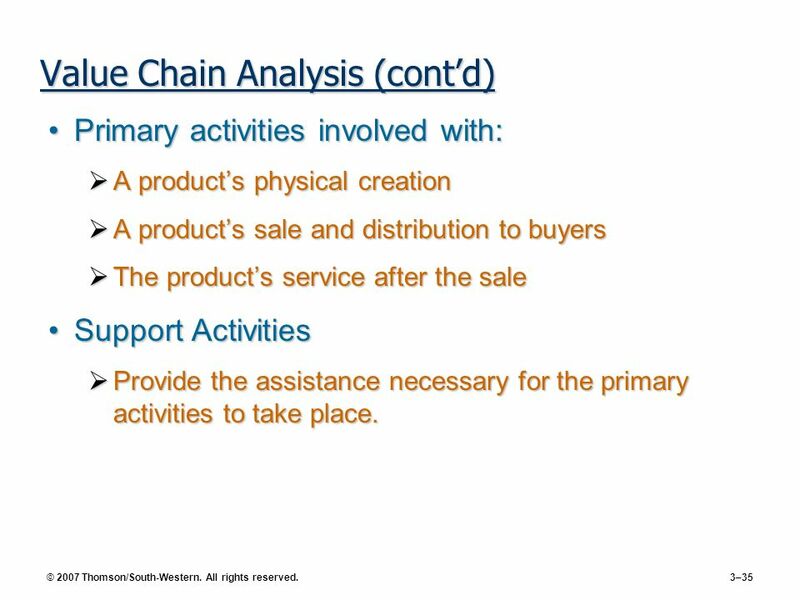 Primary activities involved with: A product’s physical creation A product’s sale and distribution to buyers The product’s service after the sale Support Activities Provide the assistance necessary for the primary activities to take place. © 2007 Thomson/South-Western. All rights reserved. Shows how a product moves from the raw-material stage to the final customer. To be a source of competitive advantage, a resource or capability must allow the firm: To perform an activity in a manner that is superior to the way competitors perform it, or To perform a value-creating activity that competitors cannot complete © 2007 Thomson/South-Western. All rights reserved. 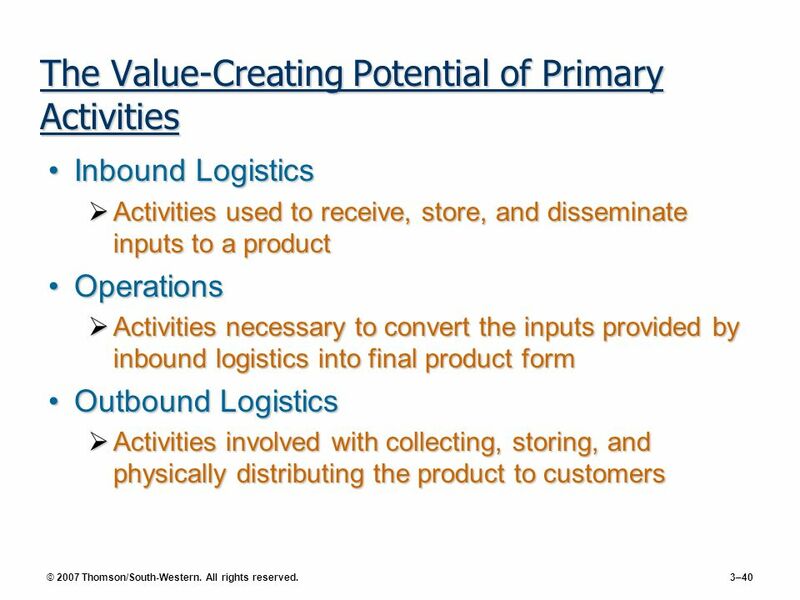 Inbound Logistics Activities, such as materials handling, warehousing, and inventory control, used to receive, store, and disseminate inputs to a product. Operations Activities necessary to convert the inputs provided by inbound logistics into final product form. Machining, packaging, assembly, and equipment maintenance are examples of operations activities. Outbound Logistics Activities involved with collecting, storing, and physically distributing the final product to customers. Examples of these activities include finished goods warehousing, materials handling, and order processing. Marketing and Sales Activities completed to provide means through which customers can purchase products and to induce them to do so. To effectively market and sell products, firms develop advertising and promotional campaigns, select appropriate distribution channels, and select, develop, and support their sales force. Service Activities designed to enhance or maintain a product’s value. Firms engage in a range of service-related activities, including installation, repair, training, and adjustment. Each activity should be examined relative to competitors’ abilities. Accordingly, firms rate each activity as superior, equivalent, or inferior. Source: Adapted with the permission of The Free Press, an imprint of Simon & Schuster Adult Publishing Group, from Competitive Advantage: Creating and Sustaining Superior Performance, by Michael E. Porter, pp. 39–40, Copyright © 1985, 1998 by Michael E. Porter. © 2007 Thomson/South-Western. All rights reserved. Procurement Activities completed to purchase the inputs needed to produce a firm’s products. Purchased inputs include items fully consumed during the manufacture of products (e.g., raw materials and supplies, as well as fixed assets—machinery, laboratory equipment, office equipment, and buildings). Technological Development Activities completed to improve a firm’s product and the processes used to manufacture it. Technological development takes many forms, such as process equipment, basic research and product design, and servicing procedures. Human Resource Management Activities involved with recruiting, hiring, training, developing, and compensating all personnel. Firm Infrastructure Firm infrastructure includes activities such as general management, planning, finance, accounting, legal support, and governmental relations that are required to support the work of the entire value chain. Through its infrastructure, the firm strives to effectively and consistently identify external opportunities and threats, identify resources and capabilities, and support core competencies. Each activity should be examined relative to competitors’ abilities. Accordingly, firms rate each activity as superior, equivalent, or inferior. Source: Adapted with the permission of The Free Press, an imprint of Simon & Schuster Adult Publishing Group, from Competitive Advantage: Creating and Sustaining Superior Performance, by Michael E. Porter, pp. 40–43, Copyright © 1985, 1998 by Michael E. Porter. © 2007 Thomson/South-Western. All rights reserved. 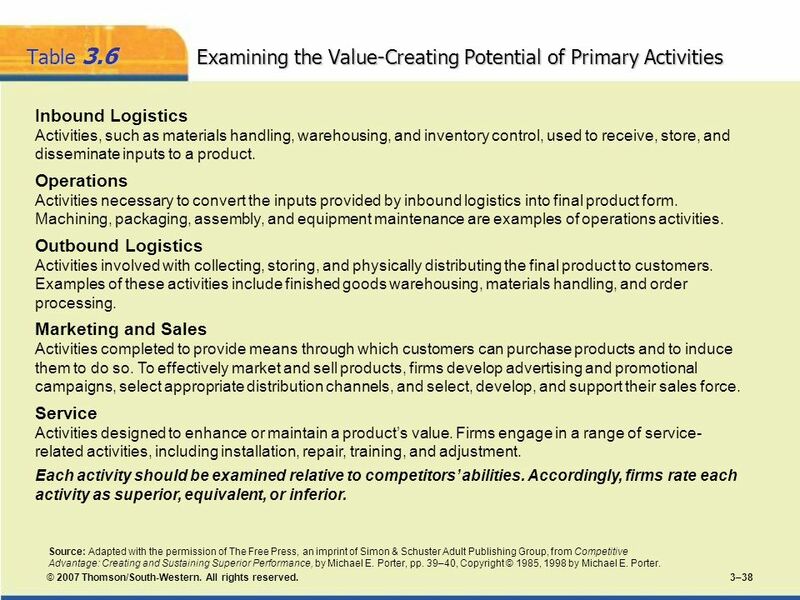 Inbound Logistics Activities used to receive, store, and disseminate inputs to a product Operations Activities necessary to convert the inputs provided by inbound logistics into final product form Outbound Logistics Activities involved with collecting, storing, and physically distributing the product to customers © 2007 Thomson/South-Western. All rights reserved. Marketing and Sales Activities completed to provide the means through which customers can purchase products and to induce them to do so. 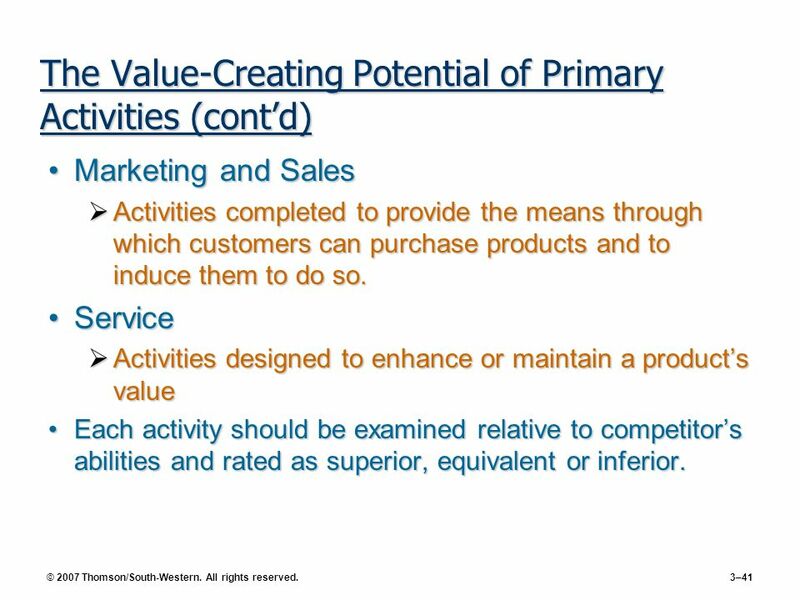 Service Activities designed to enhance or maintain a product’s value Each activity should be examined relative to competitor’s abilities and rated as superior, equivalent or inferior. © 2007 Thomson/South-Western. All rights reserved. Procurement Activities completed to purchase the inputs needed to produce a firm’s products. Technological Development Activities completed to improve a firm’s product and the processes used to manufacture it. Human Resource Management Activities involved with recruiting, hiring, training, developing, and compensating all personnel. © 2007 Thomson/South-Western. All rights reserved. 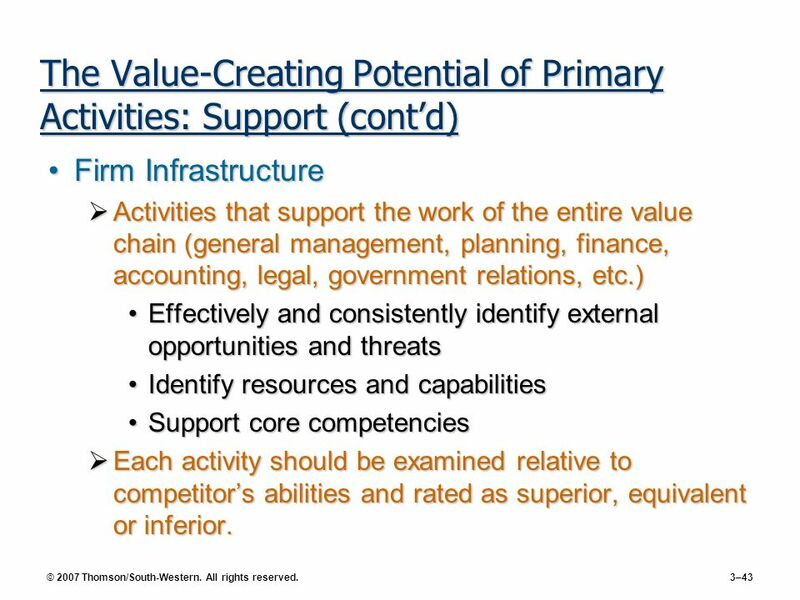 Firm Infrastructure Activities that support the work of the entire value chain (general management, planning, finance, accounting, legal, government relations, etc.) Effectively and consistently identify external opportunities and threats Identify resources and capabilities Support core competencies Each activity should be examined relative to competitor’s abilities and rated as superior, equivalent or inferior. © 2007 Thomson/South-Western. All rights reserved. Source: Reprinted by permission of Harvard Business Review from “Strategy and the Internet” by Michael E. Porter, March 2001, p. 75. Copyright © 2001 by the Harvard Business School Publishing Corporation; all rights reserved. © 2007 Thomson/South-Western. All rights reserved. 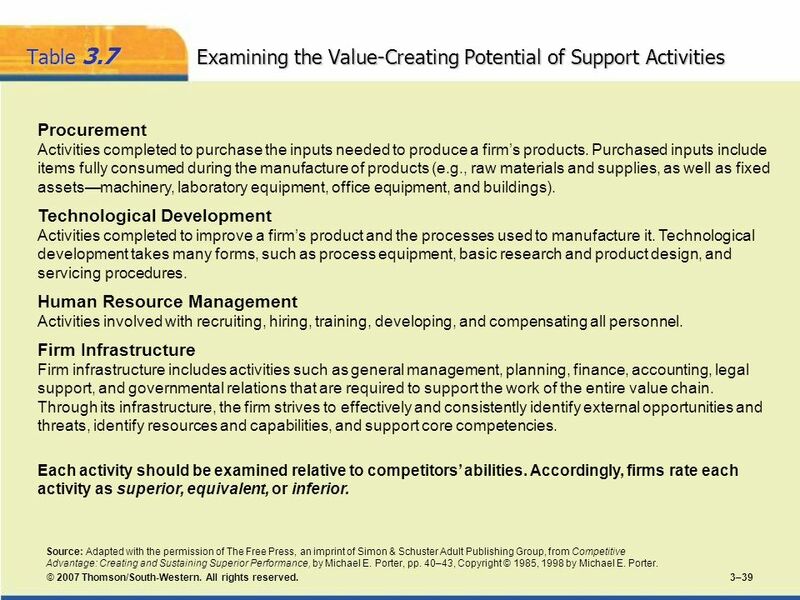 45 Outsourcing The purchase of a value-creating activity from an external supplier Few organizations possess the resources and capabilities required to achieve competitive superiority in all primary and support activities. By performing fewer capabilities: A firm can concentrate on those areas in which it can create value. 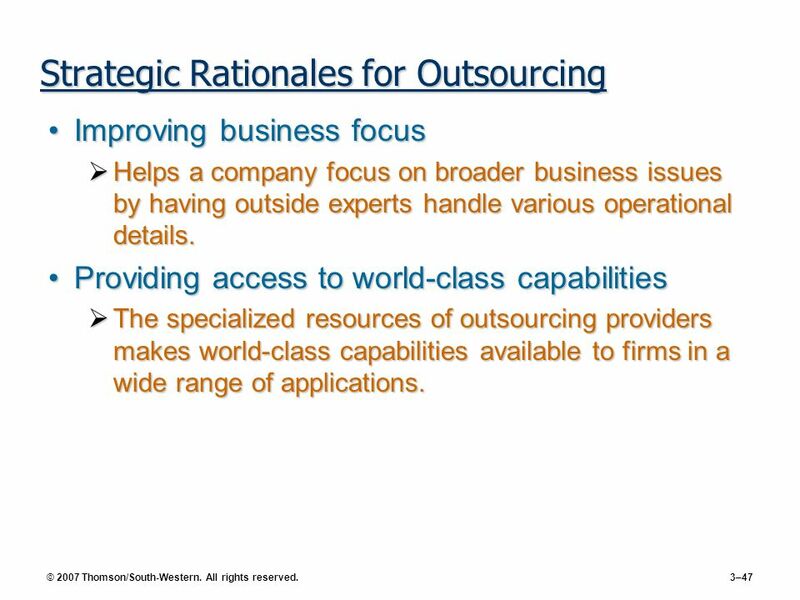 Specialty suppliers can perform outsourced capabilities more efficiently. © 2007 Thomson/South-Western. All rights reserved. 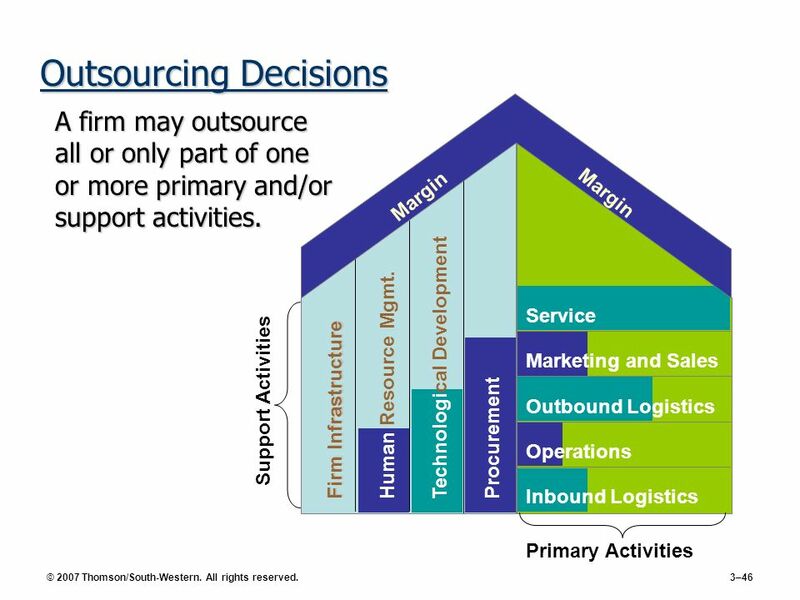 Margin Primary Activities Support Activities A firm may outsource all or only part of one or more primary and/or support activities. Service Firm Infrastructure Procurement Human Resource Mgmt. Technological Development Marketing and Sales Outbound Logistics Operations Inbound Logistics © 2007 Thomson/South-Western. All rights reserved. Improving business focus Helps a company focus on broader business issues by having outside experts handle various operational details. Providing access to world-class capabilities The specialized resources of outsourcing providers makes world-class capabilities available to firms in a wide range of applications. © 2007 Thomson/South-Western. All rights reserved. Accelerating re-engineering benefits Achieves re-engineering benefits more quickly by having outsiders—who have already achieved world-class standards—take over process. Sharing risks Reduces investment requirements and makes firm more flexible, dynamic and better able to adapt to changing opportunities. Freeing resources for other purposes Redirects efforts from non-core activities toward those that serve customers more effectively. © 2007 Thomson/South-Western. All rights reserved. 49 Outsourcing Issues Seeking greatest value Outsource only to firms possessing a core competence in terms of performing the primary or supporting the outsourced activity. 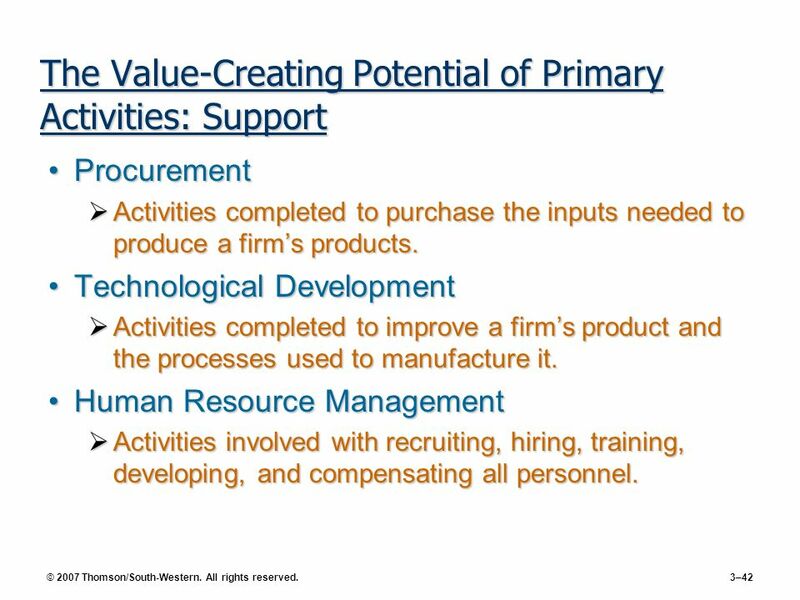 Evaluating resources and capabilities Do not outsource activities in which the firm itself can create and capture value. Environmental threats and ongoing tasks Do not outsource primary and support activities that are used to neutralize environmental threats or to complete necessary ongoing organizational tasks. © 2007 Thomson/South-Western. All rights reserved. 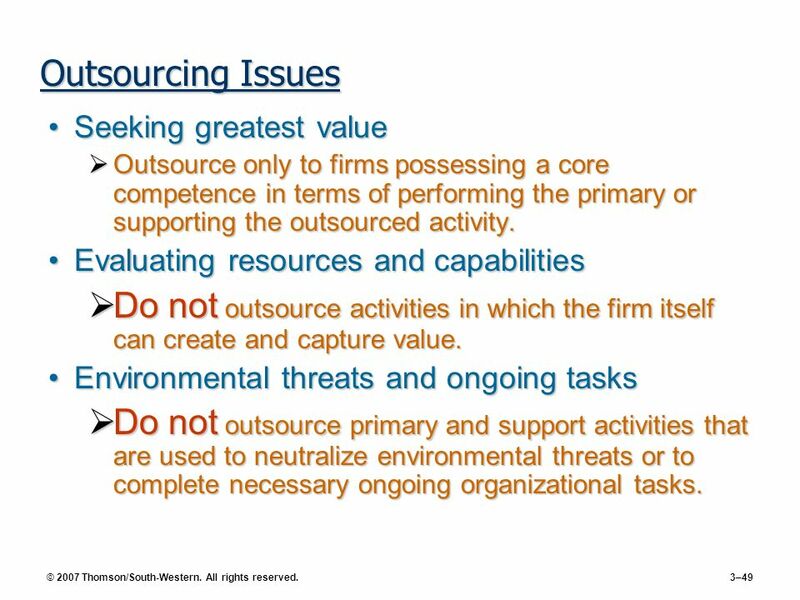 Nonstrategic team resources Do not outsource capabilities critical to the firm’s success, even though the capabilities are not actual sources of competitive advantage. Firm’s knowledge base Do not outsource activities that stimulate the development of new capabilities and competencies. © 2007 Thomson/South-Western. All rights reserved. 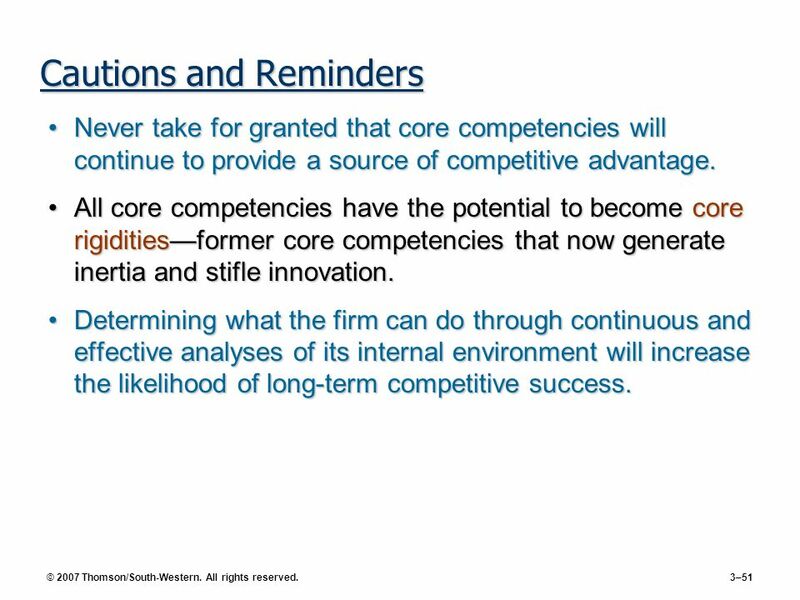 Never take for granted that core competencies will continue to provide a source of competitive advantage. All core competencies have the potential to become core rigidities—former core competencies that now generate inertia and stifle innovation. 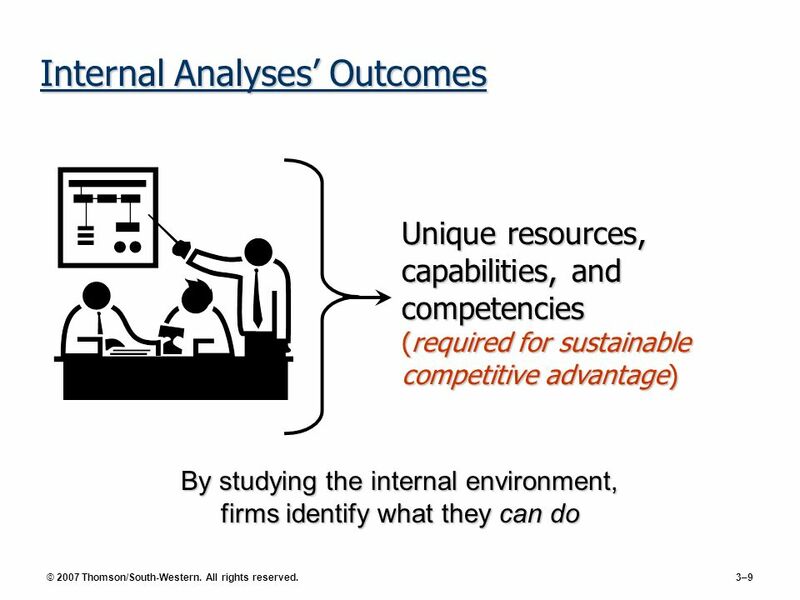 Determining what the firm can do through continuous and effective analyses of its internal environment will increase the likelihood of long-term competitive success. © 2007 Thomson/South-Western. All rights reserved. Download ppt "CHAPTER 3 The Internal Environment: Resources, Capabilities, and Core Competencies © 2007 Thomson/South-Western. All rights reserved." 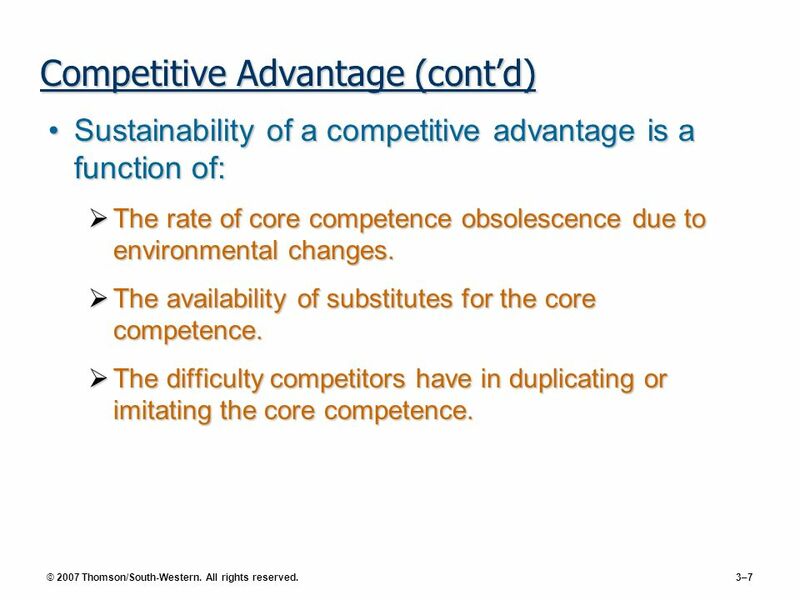 1 Sustainability of a Competitive Advantage Sustainability of a competitive advantage is a function of: –the rate of core-competence obsolescence due to. 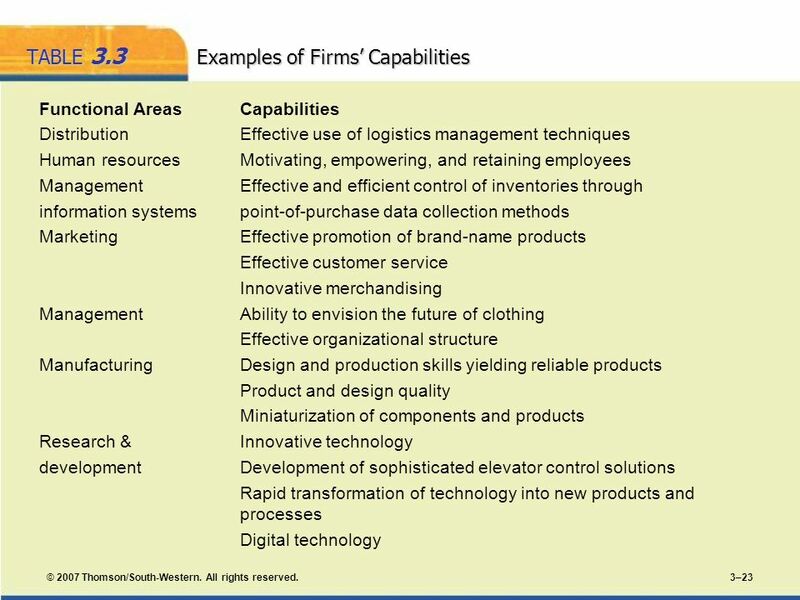 Copyright © 2012 Pearson Canada Inc. 0 Chapter 3 The Internal Environment: Resources, Capabilities, and Activities. Competing For Advantage Chapter 4 – The Internal Organization: Resources, Capabilities, and Core Competencies. CHAPTER 3 THE INTERNAL ENVIRONMENT: RESOURCES, CAPABILITIES, COMPETENCIES, AND COMPETITIVE ADVANTAGES.